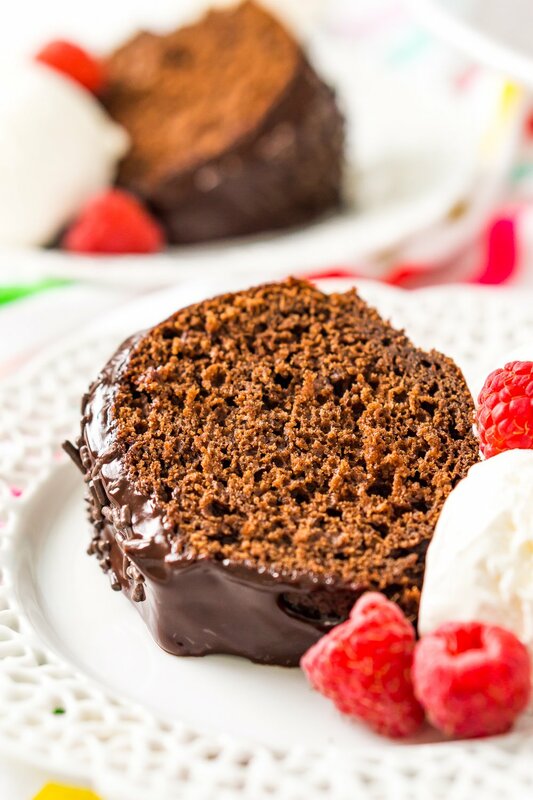 This Healthier Chocolate Yogurt Cake is a lightened up but still indulgent version of a classic bundt cake recipe made with applesauce and yogurt. We’re nine days into the new year, am I safe to assume that all the sugar haters have fallen off their bandwagons? 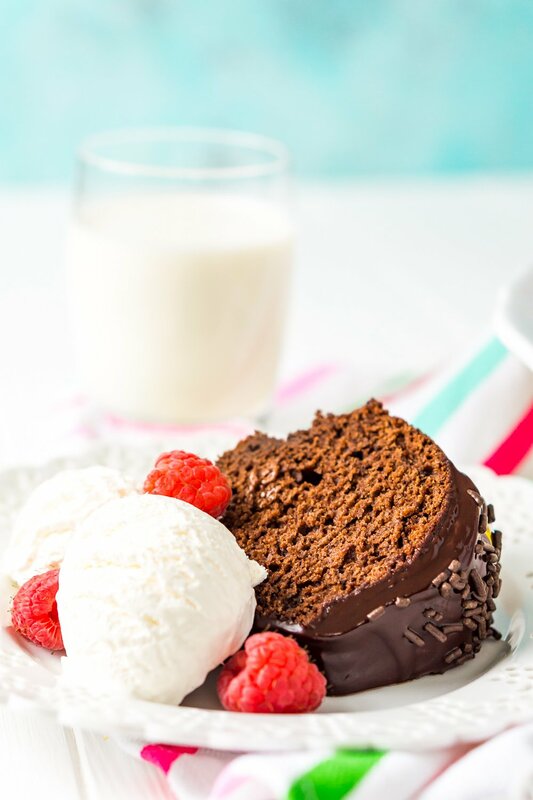 If not, I’ll ease into the dessert recipes with this Healthier Chocolate Yogurt Cake! 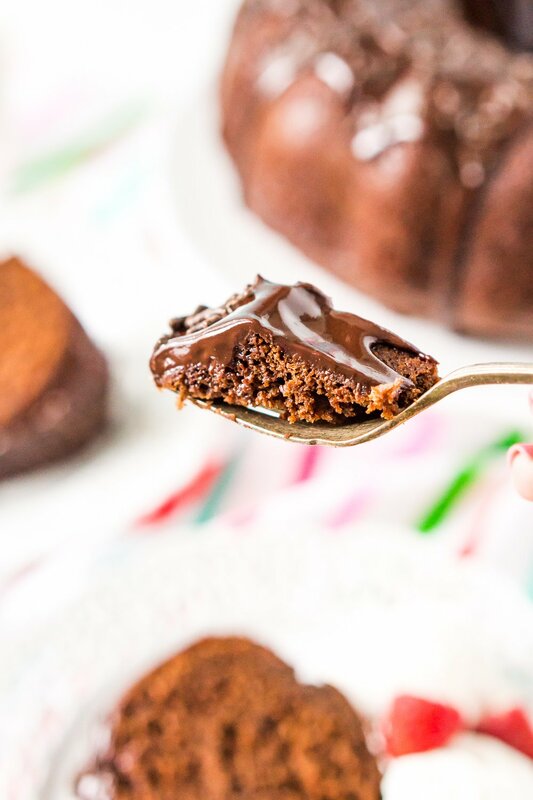 If you have a sweet tooth or there’s a special occasion coming up — and you’re trying to lighten up, post-holidays — this Chocolate Yogurt Cake will be your lifesaver! It has all the indulgence of a rich, moist chocolate cake, but with less fat and calories. That’s because yogurt and applesauce replace traditional fattening ingredients like butter, oil, and sour cream. Don’t worry, you won’t have to sacrifice flavor or texture with this Lightened Up Chocolate Cake. In fact, you’ll be amazed that it doesn’t contain the typical high-calorie ingredients! Okay, okay, it’s not my Black Magic Chocolate Cake, but it’s still pretty darn good! Yes, it’s possible to have your Healthy Chocolate Cake and eat it too … well, healthier chocolate cake, that is! This Greek Yogurt Cake is a bundt cake, so it looks elegant too, without a bunch of frosting, tools, and assembly. It’s delicious enough to serve guests you’re hosting for dinner or to share for a birthday or special occasion. 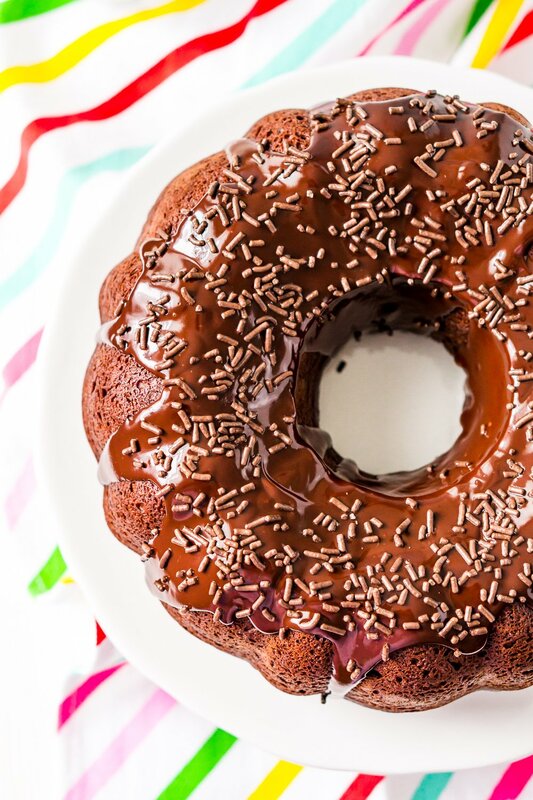 This cake is really simple to make and doesn’t require any weird or crazy ingredients. 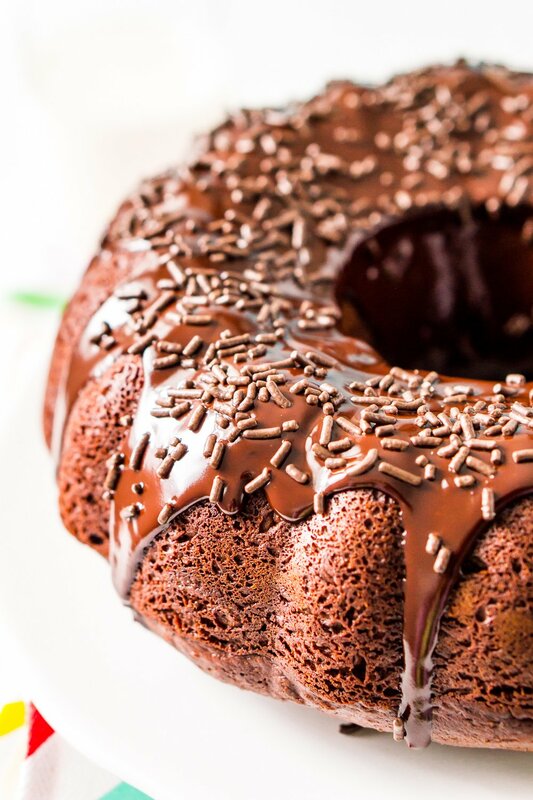 Begin by greasing a large bundt pan with cookie spray, place the pan on a rimmed baking sheet and set aside. Melt the semi-sweet chocolate in the microwave on 30-second intervals, stirring between each until melted. Mix together the melted chocolate, sugar, and applesauce. Whisk in the eggs one at a time and then whisk in the yogurt and vanilla extract until fully incorporated. Add the flour mixture to the yogurt mixture and mix just until combined. The batter will be thick. Spread the batter out in the pan and bake for 45 to 55 minutes or until a toothpick inserted into the center of the cake comes out clean. Can I Freeze Yogurt Cake? You absolutely can! Bake the cake according to the directions, but don’t add the ganache until after you’ve thawed it so it’s nice and fresh and no one will know it was ever frozen! This is perfect for having on hand for last minute company, just pull it out of the freezer a couple hours before your guests arrive and let it thaw at room temperature. But my favorite time to make this Light Chocolate Cake is on a random weeknight to enjoy after dinner. Hey, when we’re talking about Healthy Chocolate Cake, there’s no wrong time to eat it, amirite? And since we’re cutting back on calories for the cake portion, why not add a little icing on top? That faux chocolate ganache is made with dark chocolate and water and it super decadent. If you feel like cutting even more calories, you can also sprinkle it with powdered sugar for a simple finish. I also love serving each slice with some Homemade Whipped Cream. Even a little scoop of vanilla frozen yogurt will do … you know, if you’re really trying to be good. Yes, the holidays are over and we’re all trying to lighten up. 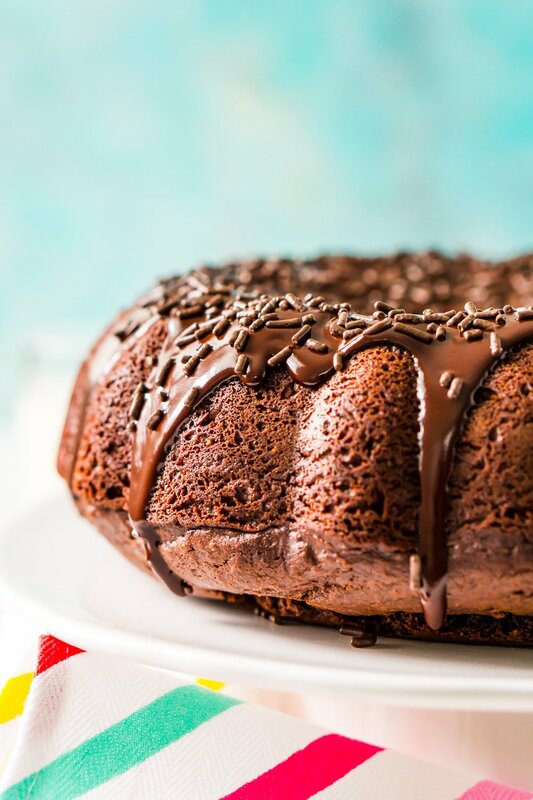 Thankfully, this Light Chocolate Cake will get you and your sweet tooth through your cravings. 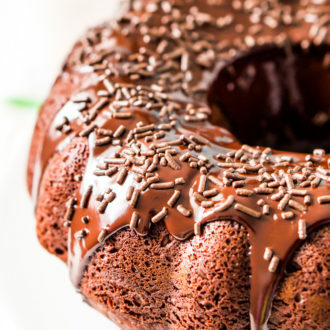 This Chocolate Yogurt Cake may be your new favorite cake recipe. Delicious enough for celebrations but light enough for a weeknight dessert, you’ll agree that cutting calories never tasted so good! Preheat the oven to 350 degrees F and grease a large bundt pan with cookie spray, place the pan on a rimmed baking sheet and set aside. Add the semi-sweet chocolate to a microwave safe bowl and microwave on 30-second intervals, stirring between each until melted. Usually, about 90 seconds works for me, once the chocolate has melted about 90% of the way, just continue to stir and the rest with melt without further microwaving. In a large bowl or stand mixer fitted with a whisk attachment, mix together the melted chocolate, sugar, and applesauce. Whisk in the eggs one at a time and then whisk in the yogurt and vanilla extract until fully incorporated. 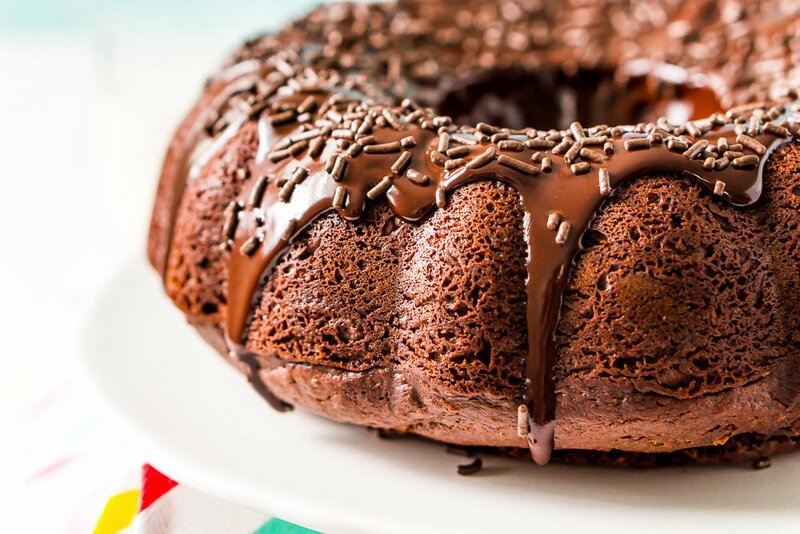 Spread the batter out in the prepared bundt pan and bake for 45 to 55 minutes or until a toothpick inserted into the center of the cake comes out clean. Remove from the oven and allow to cool in the pan for 10 minutes. Flip the cake onto a cooling rack to release the cake from the pan and then allow the cake to cool for 2 hours before making and topping with the ganache. Add the 60% chocolate to a microwave safe bowl and microwave on 30-second intervals, stirring between each until melted. Usually, about 90 seconds works for me, once the chocolate has melted about 90% of the way, just continue to stir and the rest with melt without further microwaving. Whisk in the warm water a tablespoon or so at a time, whisking until smooth. Pour the ganache over the top of the cake and top with sprinkles if desired. The ganache will slightly harden over time. Nutritional information is an estimate with the chocolate ganache. 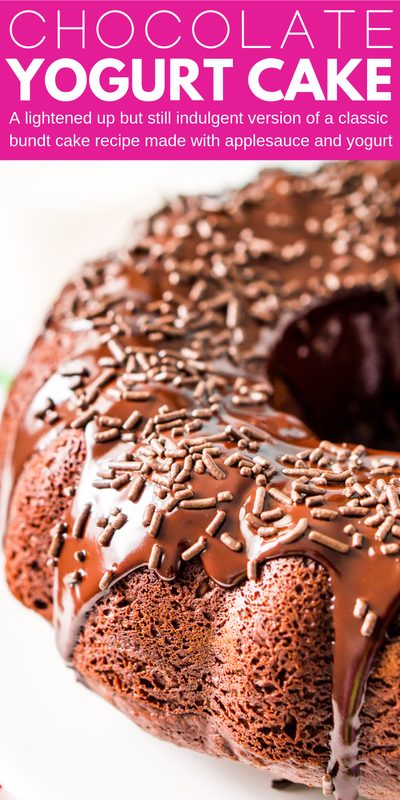 Without the ganache, each serving is approximately 250 calories. If you want to skip the ganache but still want to make it pretty, I recommend a light dusting of powdered sugar. Non-fat vanilla yogurt may also be used, but note that nutritional values may vary.